Perhaps you struggle with deciding when one photo is enough to use, versus using every shot from every event! How do you know when one photo is enough? In Single and Pretty, we discuss this topic and include some tips and tricks to flush out your single photo pages. So, whether you only HAVE one photo to use, or if using one picture is your choice, you're guaranteed to learn some great ideas on building a meaningful page around one picture. 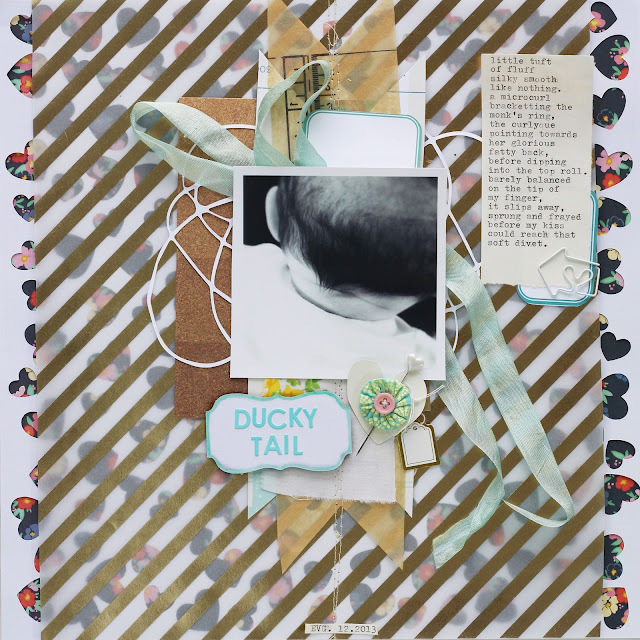 My page, Ducky Tail, is one I created for Single and Pretty.. and in the class and in my office hours interview we discuss how I created meaning with just one photo, plus the other choices I made when designing this sweet baby page.